Hello lovely readers? Hope you are all well today!! I wanted to share with you my advent calender this year. Some of you, (if not all of you) will have probably seen this on various other blogs, as there have been a few beauty advent calenders around this season. 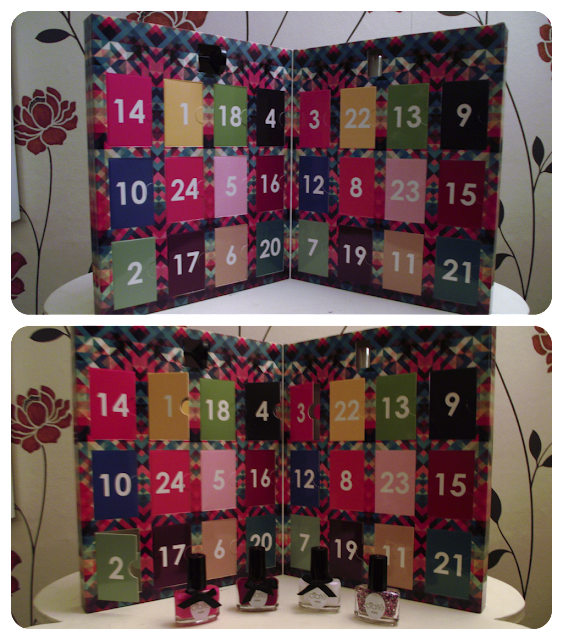 I didn't have an advent calender last year, and I wanted to try something different this year. As I am so married to my Clarins skincare, I didn't see much point in getting one of the ones that has skin care products in as this would be a bit of a waste of money, however, now I can no longer afford to have extensions every month, I do enjoy painting my nails and toenails, so I decided to treat myself to the Ciate Mini Mani Month. I don't think this is actually promoted as an advent calender - as you can see from the picture, the packaging is not particularly festive looking - but it does only have 24 doors on it, so I'm guessing it probably is! I would certainly suggest that next year it needs to be more Christmassy! 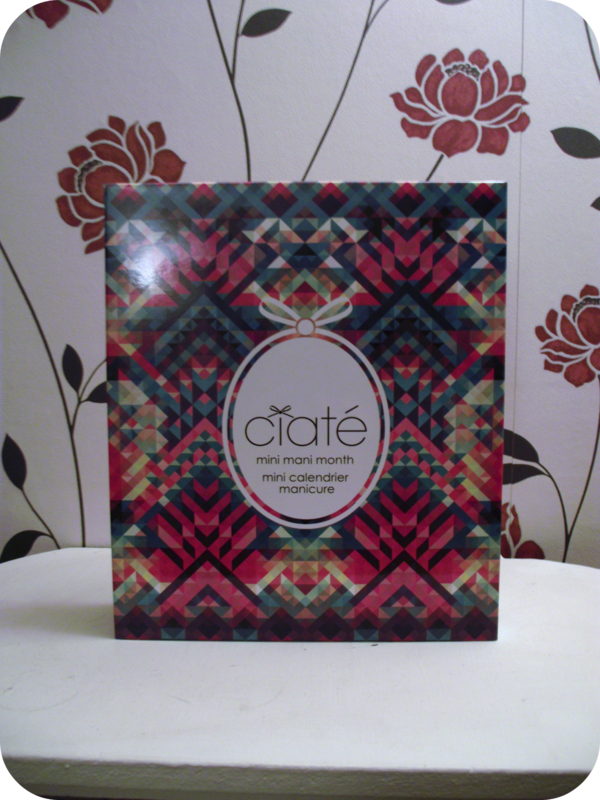 The Ciate Mini Mani Month, has a mini Ciate nail polish or caviar beads behind each door. 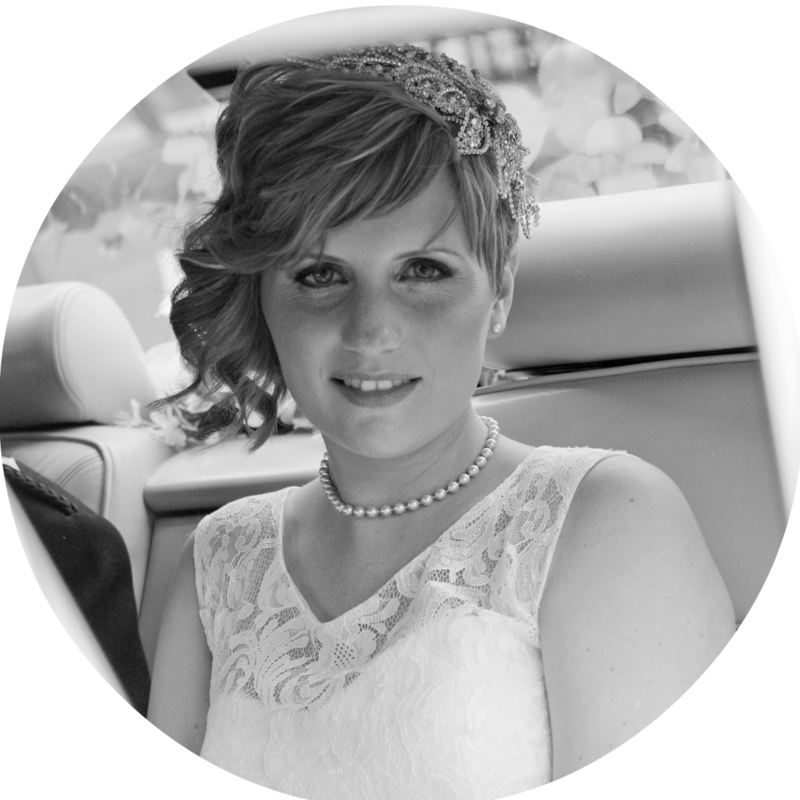 If you haven't already signed up to Ciate's website, you will get 10% off your first order purchased through them, which got me almost £5 off the price (which was actually swallowed up in postage charges though!) Unfortunately my advent calender came late, as they were having some server problems, but I called them up, and the ladies were really helpful! My order was stuck in the system, and couldn't be processed, but it meant if I re-ordered I would lost my 10% discount, but they gave me a new discount code to ensure I still got it, which was so helpful of them! Once my order was processed it came within a day! Superfast! So I took the first pictures on 4th December, but I felt it seemed silly to put up this post today, without showing you days 5,6,7 and 8 as well, which is the reason for the slight difference between the two pictures! Day 1 is called 'Cupcake Queen' (how fitting!) and it is a full on Barbie Pink! Day 2 is 'Dangerous Affair', and I think this is going to be a great Christmas Colour. Day 3 is Halo. I have tried this on my nails already and it is quite shimmery with not a lot of coverage, so I think I may wear this over another colour - perhaps over 'Dangerous Affair'? Day 4 is 'Prom Queen' Caviar Pearls. I'll be completely honest, I was never all that bothered about trying these out before, but now I've got some I will give them a go - I suspect they will be horribly impractical and fall off my nails alot! Day 5 is called 'Cabaret' which is a purple shade. Day 6 is 'Angel Wings', which for me is really similar to 'Halo' (they are only one shade number apart), although Halo has a more pinky sparkly, whereas this is more of a shimmer. Day 7 is 'Cutie Pie', and Day 8 is 'Vintage'. I think 'Cutie Pie' will make a nice french manicure base coat, or will make for some cute nail art alongside 'Vintage'. I really wanted a grey polish (is that weird?) so I was chuffed with that one yesterday! Right, I'm off to find out what is behind door number 9!! 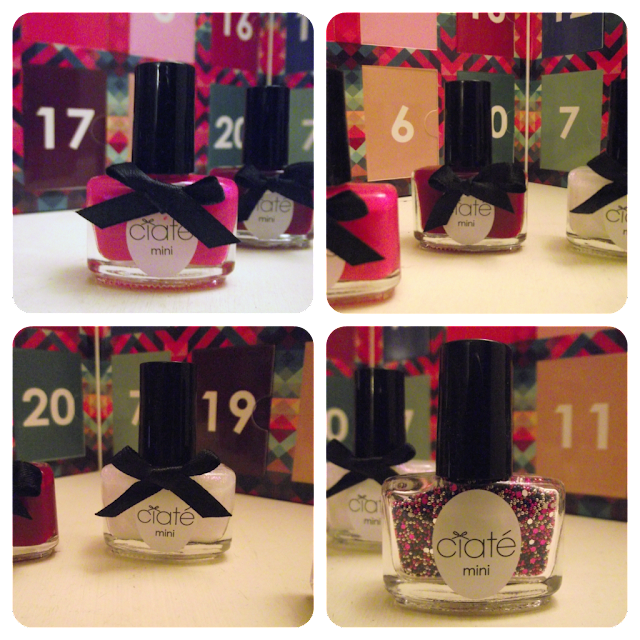 What do you think of the trend for beauty advent calenders? 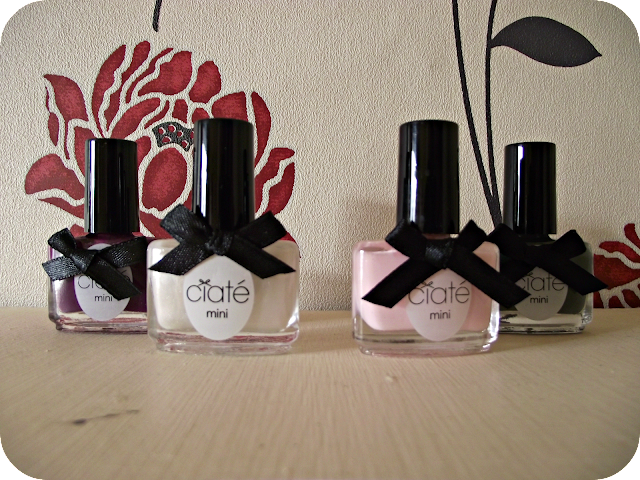 Would you like to see more of the shades in the Ciate Mini Mani Month?